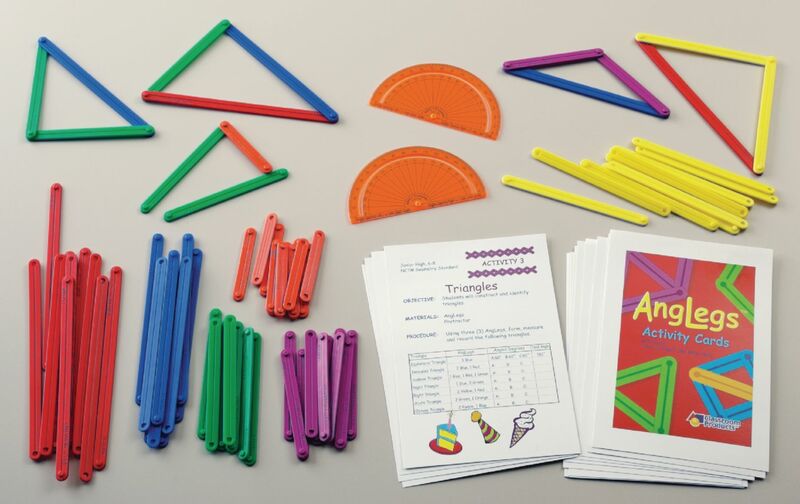 AngLegs™ is a set of plastic pieces of six different lengths that snap together allowing students to explore plane geometry on their desktop or the overhead projector. Students discover what happens as they use the same length legs verses different length legs to build various polygons. As they attach additional legs, students will learn about polygon heights, calculate their areas, find center points and much more! 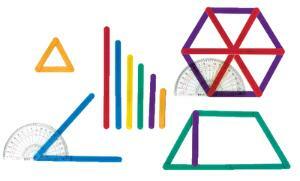 When two AngLegs™ of any length are snapped onto the special 4" protractor angles of different degress are demonstrated; add a third leg for triangles, a forth for quadrilaterals, and so on. This 74 piece set consists of 72 AngLegs™ 12 each of six different lengths in six opague colors and two snap-on View Thru™ protractors. 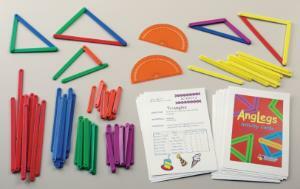 This exciting manipulative includes a set of 15 activity cards, divided into three sections for grades K-2, 3-5 and 6-8. All activities adhere to the NCTM standards for geometry. Easily share AngLeg demonstrations with the whole class on the overhead projector.